King, a Wire Fox Terrier, wins best in show at the 143rd Annual Westminster Kennel Club All Breed Dog Show at Madison Square Garden. Well, King is officially the “King” of the Westminster Dog Show. 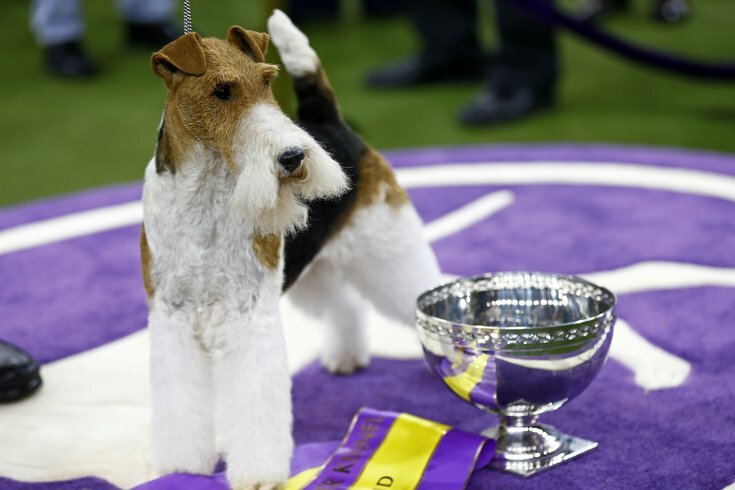 The wire hair fox terrier won the Best in Show title at the 143rd Westminster Kennel Club Dog Show. Terriers are like Tom Brady and the Patriots, the most dominant breed, winning the Best in Show title 47 times over the competition's history, and wire fox terries have won 15 times overall. Bono, a Havanese named after the U2 singer, was runner up. Other winners include Burns, a longhaired Dachshund, who won the hound group. Baby Lars, a Bouviers des Flandres, won the herding group - the first of his breed to win the group title. Bean, a Sussex spaniel won in the sporting group, a second win in a row. Wilma, a boxer, won the working group. People had some strong opinions about the terrier winning overall. Again, kind of like the Patriots. The Wire Fox Terrier winning the Westminster Dog Show is like the Patriots winning the Super Bowl. But Best in Show aside, the cutest moments of the event came from the agility round. Verb, a boarder collie, with lightning feet and laser focus won the round in 32.05 seconds with no faults. But there were three dogs that captured the hearts of everyone watching. They may not have won, but they were definitely the winners of being the most adorable. A bull dog named, Rudy, who presented himself to be quite nimble for a bulldog, clocked in at 46.63 seconds and 51.63 with faults. He certainly pales in comparison to Verb, but with an underdog name (Rudy! Rudy! Rudy!) and a A+ for effort, it's hard not to love him as nearly 3 million views of the video below shows. Gabby, the Papillon, also won the hearts of many with her swift weaving in and out of the course at 39.31 with no faults. But the real winner was Winky, a Bichon Frise, who took her sweet, adorable time going through the course, at 100.01 seconds, with 151.90 with faults. At the end of the day though, it doesn't matter who won or who was there. All dogs are winners.